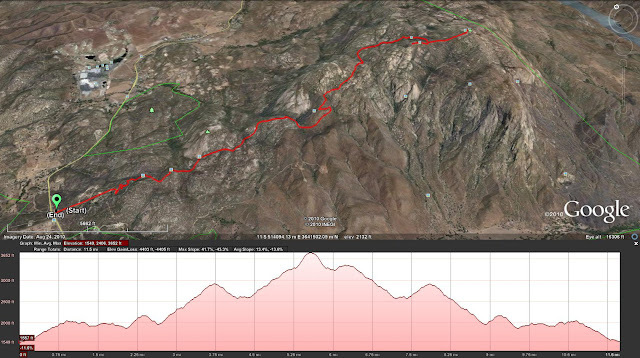 The trail up El Cajon peak is a 5 1/2 mile steep climb with very few places for shade. I hiked it once in July when it was 108 degrees and it was pretty brutal. I wanted to hike it again in cooler weather and also check out the radio station shack to the west of the peak. I was also hoping to get some good pictures but it was too cloudy out and most of the landscape was covered in thick clouds. The total distance to hike to the peak and back is about 11 1/2 miles and total elevation gain/loss is near 4,500' so it is a strenuous hike for most people. If you decide to go take plenty of water, even if it is cold out, you will be sweating as you hike up the very steep sections. I personally carry 6 liters and drink most of it. The trailhead and parking area directions can be found here. For this I recommend the approach from the South Arete. Very gratifying.